It is a situation that must send shivers of anticipatory (even smug?) delight down the spines of all the peak-oil prophets who've been warning us we'd better figure out how to hunker down and self-sustain. We're talking about the boom in renewable energy exploration here in Humboldt County -- the "new gold rush," as David Boyd, executive director of the Redwood Coast Energy Authority, calls it. You've got DG Energy Solutions, which operates the Fairhaven biomass power plant on Samoa Peninsula, proposing to add wind turbines and wave-energy-capturing buoys to its site. You've got PG&E catching that wave energy bug, as well -- in February the utility applied to the Federal Energy Regulatory Commission to stake out 136 square miles of ocean off the Humboldt coast, two to three miles offshore, to study the wave-harnessing potential. And you've got Shell WindEnergy proposing to put wind turbines up on Bear River Ridge, between Petrolia and Ferndale. If one casts purely an optimistic eye upon all the latest projects brewing out there and the prospects for even more projects, in addition to the existing renewables already produced here -- hydro, biomass -- it isn't all that crazy to imagine a future Humboldt County powered without fossils. (We're not talking, here, about our gasoline- and diesel-powered vehicles -- that's another, very big, story; half our energy consumption is in transportation fuels, according to the RCEA). Someday, when we whir the blender, turn up the furnace, flip on the lights, fire up the computer -- green, green, green. In fact, the renewable energy potential in Humboldt County is so high there could be a surplus of renewable energy far beyond the demands of our snail-crawl population growth. 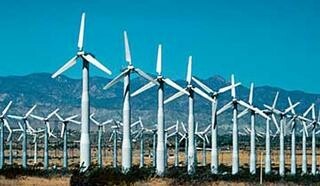 According to the "energy element" section of Humboldt County's draft General Plan, prepared by Schatz Energy Research Center, the wind potential for Humboldt County is 400 megawatts and the wave potential is 500-1,000 megawatts. Some estimates reach even higher. In the winter time, our peak energy usage period, Humboldt County consumes only 150-160 megawatts. Wind and wave offer the largest renewable potential, followed by biomass, hydro, solar and others. Much of that renewable development is speculative at this point, particularly on the wave front. But to those who want to find a way to boost our local economy, the prospects are tantalizing: We could sell this extra green power to the less geographically fortunate, those California towns and cities still struggling to do their part to help the state meet its Renewable Portfolio Standard -- a mandate that the state's renewable generation must equal 20 percent of power sales by 2010. And the green boom could draw an influx of entrepreneurs to set up shop in Humboldt County. But for the would-be profiteers from the green-power goodness, there's the little problem of our area's electrical transmission capacity. It's small. Four lines connect Humboldt County to the outer world, and Pacific Gas & Electric's main grid system: two lines between here and PG&E's interconnect station at Cottonwood (near Redding), a line from Bridgeville-Garberville and a line from Trinity County. "The sum total of the instantaneous power that can be imported or exported, on demand, is 70 megawatts," says Boyd. And so already the county must produce at least 80 megawatts locally. A small portion of local energy is from biomass and hydro, but most local power is produced by PG&E's natural-gas-fired power plant at Humboldt Bay (and most of the gas is imported); upgrades to the plant will improve its efficiency to where it'll be able to produce the entire current demand, if need be. But, the new plant is being designed to operate on 10 engines -- instead of one big one -- any number of which can be turned off at any time to accommodate the addition to the local system of renewable energy generated by intermittent sources such as wind and waves, or by the more steady biomass. For now, the county is looking at continuing to rely on that mix of fossil/renewables energy, with the current transmission system able to accommodate only so much renewable development. But the would-be renewables producers could end up vying for space. Shell's wind project, for instance, is farther along than the wave projects. If Shell Wind comes online first, would the other renewable projects lose steam? Would other possible projects stall in the concept stage? "It'd be nice if we didn't have the transmission constraint, and each could develop on their own merit," says Boyd. "But we're limited to whatever technology opens up first. Which could be Shell." Even Shell has already had to scale its project back by more than a half. "We're down to 50 to 70 megawatts," said Tim O'Leary, spokesman for Shell Wind, on Monday. "We were looking at 150 megawatts. We'd like to do bigger projects. Originally, it was going to be on [two ridges]." But then the California Independent Systems Operator (CAISO), a not-for-profit public-benefit corporation in charge of most of the state's high-voltage wholesale power grid, told Shell to shrink the project because of the local transmission constraint. Either that, or upgrade the area's transmission capacity at a cost of a couple hundred million dollars. "We're not looking at privately financing Humboldt's rewiring," said O'Leary -- the wind project couldn't pay for it. "But we're still doing studies on the larger area." Many renewable projects that could happen won't until the transmission constraint is lifted -- none of them have the means for such a huge undertaking, and under current law, the cost of transmission upgrades fall upon project proponents. Boyd cites a study that found it would cost $200 to $250 million to upgrade the system to increase Humboldt's transmission capacity. PG&E "chose not to upgrade the lines," he says. "They chose to upgrade the [Humboldt Bay] power plant." PG&E's spokesman David Eisenhauer said PG&E is still looking into the transmission issue, but can't speak specifically yet. "During the process of determining how much and when to upgrade our transmission facilities, that desire to increase our renewable energy weighs heavily, as does the increase in electric demand. ... There is a study process that goes on between PG&E, CAISO and any other parties (i.e. Shell Wind) to determine grid capability to handle any new generation, which would also determine any upgrades that would be needed to meet increased generation and demand, and it would be premature and potentially misleading to speculate on the outcome of such a study." The conundrum of too much power potential and no way to share it deprives us of the ability to "share the environmental benefit with the world," says Boyd. Michael Winkler, a researcher at Schatz Energy Research Center, says there's another way to look at the energy "surplus": Figure out a way to store the intermittent renewables from wind and wave -- with batteries, hydrogen fuel cells, ice and heat mechanisms -- and use it all locally. But Gregg Fishman, of the California ISO, calls storage "really kind of the holy grail." "At this point, it is not typically viable," he says. "And it has its own environmental impacts."